Santa Ana, CA (10/24/2013)  Theatre Out, Orange County’s gay and lesbian theatre company, who brought you the hit production of [TITLE OF SHOW] earlier this year, is pleased to present the return of musical cult classic THE ROCKY HORROR SHOW beginning October 31, 2013. Running through November 23, this Science Fiction parody musical, with book, music and lyrics by Richard O’Brien, has been a favorite with audiences since it opened in London in 1973. THE ROCKY HORROR SHOW follows innocents Brad and Janet as they travel to visit their mentor to announce their engagement. But like most Sci-Fi Horror movies, things go painfully wrong on this dark and stormy night. When their car breaks down, Brad and Janet find themselves at the castle of Dr. Frank N Furter which is filled with an eccentric staff headed by butler Riff Raff and maid Magenta as well as odd party-goers including the overly enthusiastic Columbia. Something is definitely not right about this party. Brad and Janet know they are in for a life-changing night when they actually meet Dr. Frank N Furter, who describes himself as a sweet transvestite from Transylvania who is in the process of creating a man. Ultimately, Riff Raff and Magenta have bigger plans for Frank, Brad, Janet and all of the party-goers. Shortly after its London premiere in 1973, THE ROCKY HORROR SHOW was turned into the classic film THE ROCKY HORROR PICTURE SHOW. The film became an instant classic and can still be seen today at art house theatres with audiences recreating scenes and adding colorful dialogue. The Golden Rain News exclaimed Theatre Out’s 2012 production as a “raucous revival!” StageSceneLA applauded the production “as Frank-N-Furtastic a Horror Show as any fan could ask for!” honoring it with 6 StageSceneLA awards including a best actor award for Andrew Villarreal who will be reprising his role as the transexual Dr. Frank N Furter. Audiences are encouraged to participate at performances of THE ROCKY HORROR SHOW with verbal callbacks and dancing. For the safety of the actors and the audience, audience members are asked not to throw objects, including rice, toilet paper and toast at the stage. Under the direction of Co-Founder and Managing Director, David C. Carnevale, the cast includes Andrew Villarreal, JT Corzine, Chelsea Feller, Andrea Dennison-Laufer, Nick McGee, Nicki Peek, J. Mel “Melvis” Jaragin, Brandon Kasper, Ben Green, Keke Regele, Megan Endicott, Fermin Bello and Michael Groover. Musical direction is by Stephen Hulsey with original choreography by Nicki Peek expanded from the work of Alissa Sanchez. The scenic design is by Joey Baital with original costumes designed by David C. Carnevale. 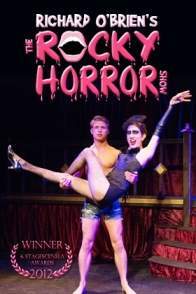 Tickets for THE ROCKY HORROR SHOW range from $20-$25 General admission and can be purchased at www.theatreout.com or at the Box Office on the night of the performance based on availability. All performances are at Theatre Out’s new venue at 402 W. 4th Street in Santa Ana. Peformances begin October 31, 2013 through November 23, 2013; Fridays and Saturdays at 8:00 pm with select Thursdays at 8:00pm and select Saturdays at 4:00pm. « Tet Festival pulls out of Garden Grove, but will it return to Santa Ana?